Their purple color except from tasty fruit also makes them valuable, since their color is the cause for the rich antioxidants. This tiny nutritional treasure, offers rich nutrients especially antioxidants, which protect our body from cancer, strengthen the heart and prevent infections of the urinary system. Get accustomed to the sweet and sour taste of the cranberries, include them in your diet and get multiple advantages by their beneficial action. Thanks to their antioxidant content, cranberries protect from infections of the urinary system. For many years, researchers believed that their ability to prevent problems such as infections of the urinary system was mainly due to their high acidity. However, recent data show that it is not their acidity, but the special structure of the proanthocyanidins they contain, which prevents the adhesion of bacteria to the walls of the bladder and the urethra. 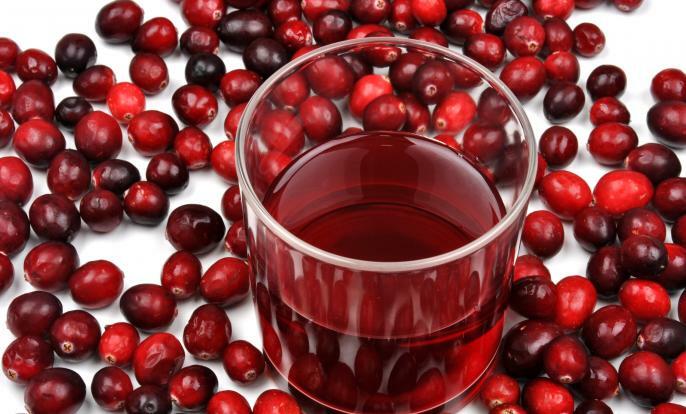 A study of the Medical Faculty of Harvard University in elderly women who drank 1-2 glasses of cranberry juice on a daily basis for six months has shown that the number of bacteria in the bladder has been limited and, furthermore, that they had almost 60% less chances to have infections there. Also, women who had infection of the urinary system and drank juice had 75% more chances to recover faster, in relation to those that did not drink. Other laboratory investigations showed that this plant has the ability to significantly reduce recidivism of infections of the urinary system in pre-pubertal girls. These results are of particular importance since the findings of the National Institute of Health USA proved that one in five women will undoubtedly experience an infection of the urinary system during her life. But also men, who are less susceptible to infections of the urinary system, appear to be benefiting from the action of cranberries. The tiny fruit fights against inflammation of the prostate, while reducing the possibility of its malignant hyperplasia. Cranberries are a very good source of vitamins C, K and E, manganese and plant fibers. More specifically, half a tea cup (about 50 g) contains 6.65 mg vitamin C, 2.30 g vegetable fibers, 0.18 mg of manganese, 2.55 mg vitamin K and 0.60 mg vitamin E.
This fruit can very easily be included in a diet menu, since it is low in calories. Half a teacup does not exceed 23 calories. However, in addition to its nutritional value, the consumption of these fruits enriches our diet with powerful antioxidants. It has been found that cranberries are particularly rich in proanthicyanidins, flavonoids, flavonols, ellagic acid, chlorogenic acid, quercetin, myricetin and other substances, all of which are compounds with antioxidant action two and five times stronger than those of vitamins C and E respectively. This, therefore, means that they prevent the damage caused by free roots, i.e. the harmful oxygen molecules produced in the human body which are responsible for cancer, heart disease and a lot of other serious problems. According to scientific studies, cranberries are a good source ellagic acid, a substance which has antioxidant cancer action. The results of clinical trials have shown that this ingredient seems to prevent the degradation of DNA, to “disarm” the action of cancerous cells and hinder the development of tumors. They even seem to be helping in the fight against cancer cells before and after the outbreak of the disease, and may prevent metastases as well. This antioxidant, when isolated in the lab, is not absorbed by the blood as well as when it is contained in foods that we eat. Therefore, this is another suggested reason for its frequent consumption. Their anti-inflammatory properties contribute to the health of the cardiovascular system. Their consumption reduces “bad” cholesterol and combats chronic inflammation associated with the development of arterial plaque, thus preventing cardiovascular diseases. In experiments carried out on animals, the substances of cranberries reduced the oxidant stress, which is a plaque-forming factor. It has been found that cranberries reduce the inflammation of the gums caused by bacteria that are responsible for periodontitis. Raw or frozen: Cooked fruit lose many of the nutrients they contain, therefore prefer raw or frozen ones. They are suitable for freezing, because their peel is hard. They can be kept up to 4 weeks in the refrigerator. As a juice: You can puree and drink them as juice just them or in combination with other juice and drinks. Combine their juice with fruit, such as orange and grapefruit, but also with drinks such as soda, vodka and white wine. As a sauce: If you like cooking combinations, try cranberry sauce for turkey, red meat or even fish. Those of you who are less daring you can make a simple and quick salad. Cranberries “blend” nicely with rocket and spinach. In addition, cranberries are perfect for confectionery as well. In sweets: Because of their high pectin content they are suitable for making jams and jellies, and can be used in various sweets (cakes, puddings, etc. ) in dried form like raisins.